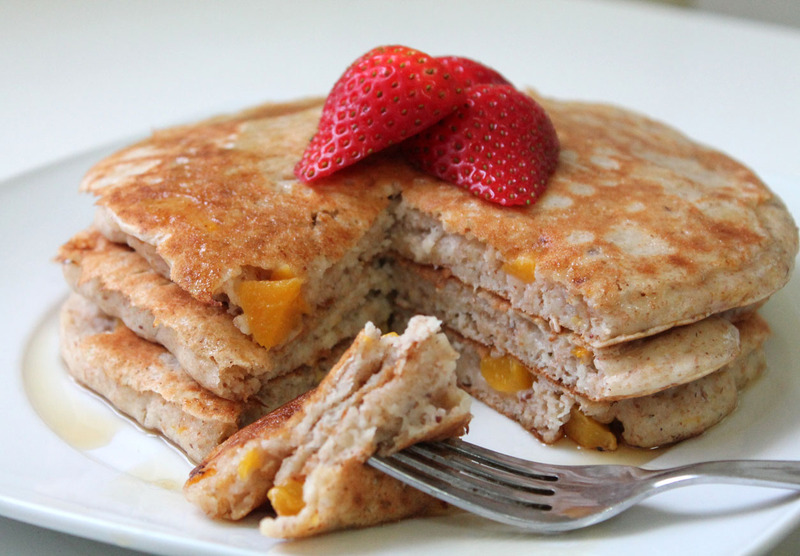 Vanilla Peach Buttermilk Pancakes | Live. Learn. Love. Eat. 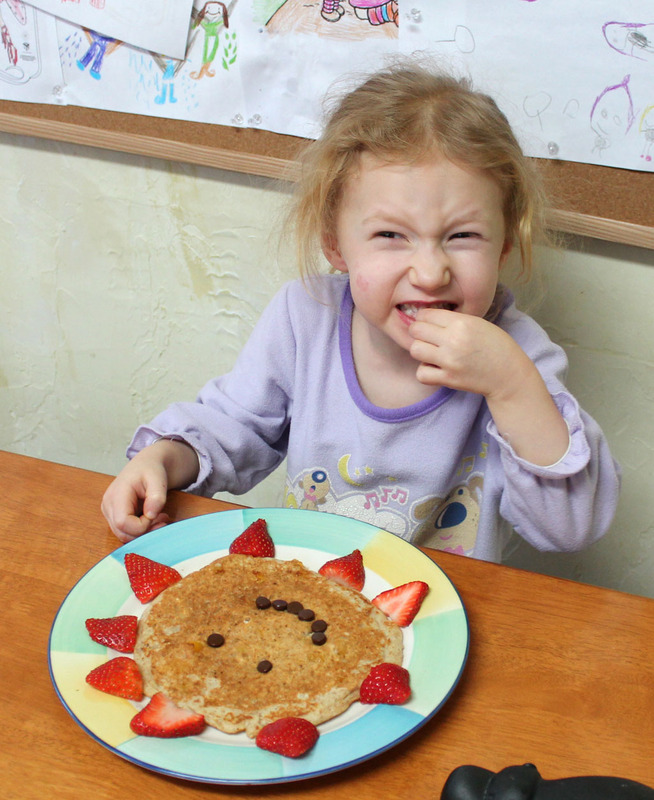 This morning I surprised the girls with a fun breakfast. 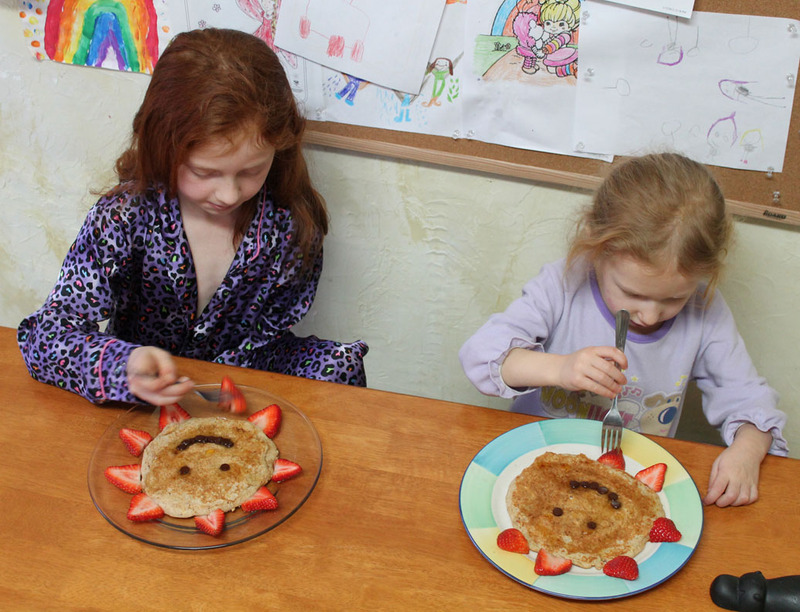 I made a recipe for delicious Vanilla Peach Buttermilk Pancakes and then turned the pancakes into happy sunshine pancakes for the girls, which put a smile on their faces. 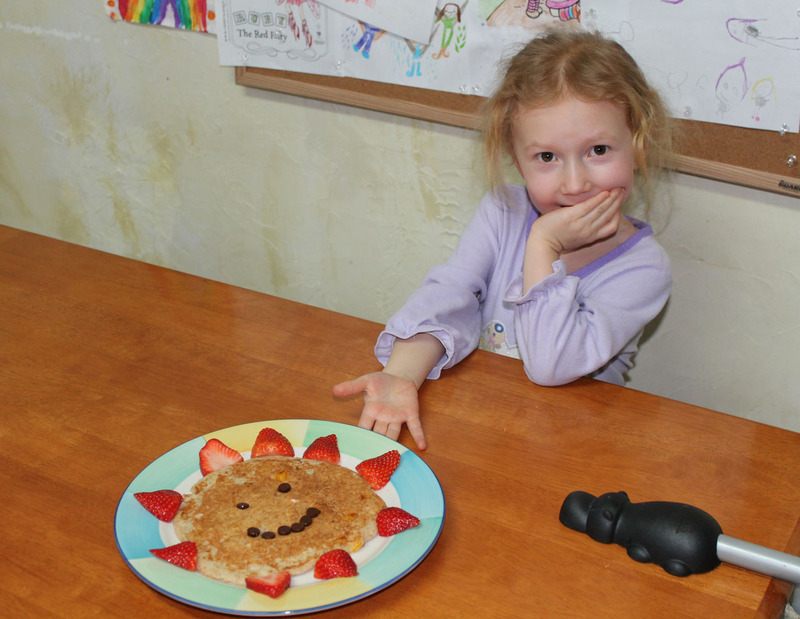 I sliced up some strawberries to put around the pancake for the sunshine rays and put some chocolate chips in the pancake for some eyes and a smile. To make 1 cup of vegan buttermilk, place 1 tablespoon of apple cider vinegar or lemon juice in a 1 cup measuring cup. Add soy milk to the measuring cup, filling it all the way to equal one cup. In this case you will need 2 tablespoons of apple cider vinegar or lemon juice and enough soy milk to fill a liquid measuring cup to equal 2 cups. For this recipe I also used vanilla soy milk to amp up the vanilla flavor. 1. Combine the flour, baking powder and sea salt in a large mixing bowl. 2. In a small dish, whisk together the ground flax seed and water to make your flax egg. Set the flax/water mixture aside for a few minutes to thicken. 3. Place the vegan buttermilk in a small mixing bowl along with the sunflower oil and vanilla. Add the flax egg to this mixture as well. Whisk all of the wet ingredients together until smooth and then add the diced peaches. 4. Pour the wet ingredients into the large bowl with the dry ingredients and mix until combined. 6. Heat a non-stick skillet on med-high heat. Pour about 1 cup of the batter into the pan and cook the pancake until small bubbles start to show through the batter. Flip the pancake over and cook a few minutes more. Continue to make 6 pancakes. 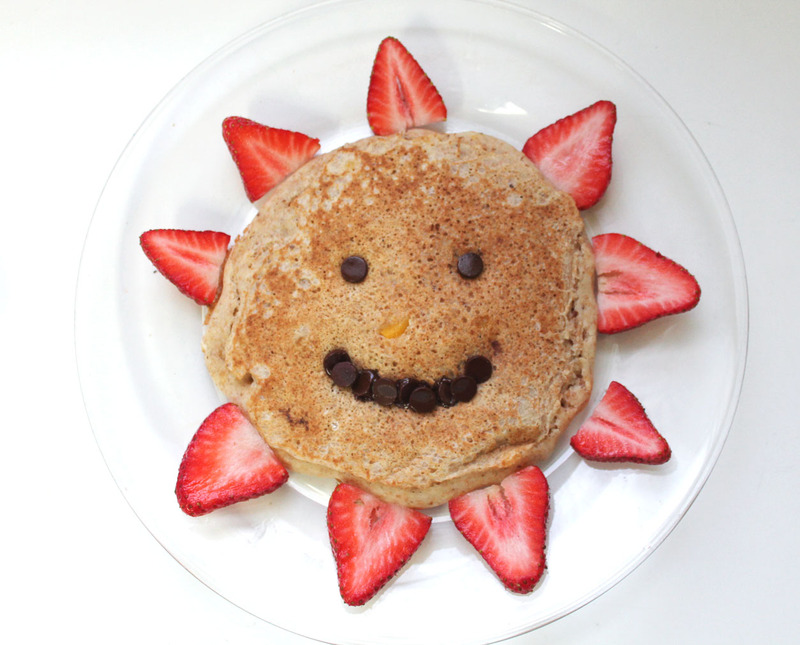 Serve with vegan margarine, pure maple syrup and fresh fruit. I could have used that to wake up to this morning. This sounds delicious. Did you use canned or fresh peaches? And if fresh, where on earth do I locate them at this time of year? I have been craving a peach smoothie for a very long time. I used some peaches from the girls Dole fruit cups they got the other day. They were perfect in this recipe. Pingback: Sugar Free Chocolate Cupcakes with Maple Raspberry Icing | Live. Learn. Love. Eat. Pingback: Four | Live. Learn. Love. Eat. Pingback: Strawberry Shortcake Cupcakes | Live. Learn. Love. Eat. Can you use almond milk instead of soy milk to make the buttermilk?